Ok here’s where I confess and introduce you to the wizard behind the COOL Wildlife website curtain……..Photocrati. When I began looking into putting together my own wildlife photography website I had zilch, zero, zippo, nil, nada knowledge of html so I had no idea how to design a photography website. It was a very intimidating thought to say the least. That all changed when I found Photocrati WordPress for photography, as they have an offering that allows you to buy a photography website or more to the point use their photography website templates to design your own site. Best of all these are photography website templates that are menu driven, drag and drop thanks to their infrastructure being built on WordPress for Photography. Photocrati has put together a collection of 60 out of the box themes that are tailor made for photography website design. All you have to do is drop in your content and images, it really is that simple. Before I continue and you stop reading let me answer the question that’s going through your mind right now, “How Much?” I had already scoped out having a web designer do the work for me back in my intimidation unaware phase and that bill was running into the thousands so when I found an offering that allowed me to buy a photography website template built on WordPress for just $89 I was thrilled but highly skeptical. There were two main reasons I was still very leery and I’ll be honest I researched several other offerings and it took me two weeks before I finally took a chance and spent the money on the Photocrati photography website templates. Reason 1: If a web designer is charging thousands can you really buy a photography website for $89 that is worthy? Reason 2: I still did not know a thing about how to design a photography website so if I ran into problems who would I turn to? I finally took the chance, as much as chance can be for $89, (the Scotsman in me coming out) because in several of the reviews I found through Google users spoke of the excellent support they had received from Photocrati and the boat load of plugins available through the WordPress for photography platform. Now that I have been a user I can tell you it is like having a web design coach at your beck and call. It actually comes with the $89 download and I can tell you first hand their support team are super responsive and always at the ready to help. Lastly I figured surely if the 10,000 photographers that had downloaded the website design templates before me had a problem I would have discovered that in my extensive research so it seemed like a safe bet. Long story short I ponied up the $89, selected one of the 60 out of the box photography website templates that are offered on the Photocrati website, and bingo I was ready to get started. By the way you can review and try (yes they are functional websites) all 60 of the photography website templates before purchasing absolutely free just in case your Scottish too. The COOL Wildlife website was up and running with a few pictures and content after day one. The speed at which your site will get developed is only limited by the time you have to give to the project. Access to menu driven drag and drop photography website templates, 60 out of the box, in a variety of color schemes. Helpful web design support staff at your finger tips just in case you have questions. Access to thousands of free WordPress for photography plugins so you can virtually create anything you can think of on your website. Built in e-commerce so you can sell your photography. Gallery Management. As easy as 1-2-3 to add and delete images within whatever gallery pages you have created. Blogging capabilities. You can visit my wildlife photography blog as an example. The ability to easily point visitors to your Twitter, Facebook and RSS feeds. and a whole lot more which you will discover once you dive in. You’ve heard me mention WordPress for photography a few times so let’s touch on that briefly. 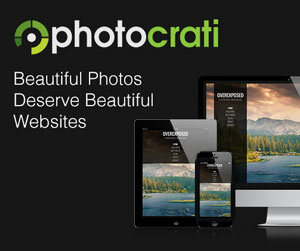 Photocrati photography website templates are built on the WordPress platform. This is an important point in your decision to choose Photocrati because WordPress is an open source platform. This means that anyone can contribute to it from around the world, so literally 10’s of thousands of people design thousands of those WordPress plugins I referred to. To help explain let me give you an example of a WordPress for photography plugin. I wanted to setup a poll to see what wildlife images people liked on my site. The poll you see on my COOL Wildlife site is a WordPress plugin. Please feel free to give it a try and place your vote. From conception to posting it took about 30 minutes. The list of possibilities is endless which is probably why as of 2010 there were over 25 million websites built on WordPress themes. In summary, I never thought it would be possible to buy a photography website template so cheap and end up with a quality site, that’s easy to manage with free support at my finger tips. I hope this review helps you minimize the time you spend making the decision so you can put the time to better use designing your own site. Have fun!!! Verdict: The Photocrati Photography photography website templates built on WordPress for photography gets a COOL Wildlife photography two paws up.